233, Hubcap, 15", 69-71, JEEP, JEEPSTER, WAGONEER, MAG TYPE, WITHOUT HUB HOLE. 3013, Hubcap used, 13", 65-69, CHEVY, CHEVY II, CORVAIR, RWD, 5 SPOKE, MAG TYPE. 3038, HUBCAP USED, 14", 70-72, CHEVY, CAMARO, CHEVELLE, NOVA, 5 SPOKE, MAG TYPE. 311, Hubcap used, 14", 66-67, DODGE, POLARA, MONACO, PASSENGER, MAG TYPE. 318, Hubcap used, 14", 67-69, PLYMOUTH, BARRACUDA, VALIANT, PASSENGER, MAG TYPE. 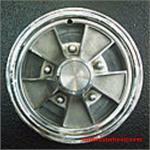 620, Hubcap, 15", FORD, F100, F250, F350, VAN, MUSTANG, PASSENGER, MAG TYPE, WORD FORD IN CENTER. 844, HUBCAP USED, 14", 86-97, FORD, AEROSTAR, 5 SPOKE MAG DESIGN, FAKE LUG NUTS, AVAILABLE WITH TWO STYLE OF RETAINING CLIPS BOTH INTERCHANGEABLE.